By Rob Smith: Andre Berto (28-2, 22 KO’s) was beaten tonight by WBC interim welterweight champion Robert Guerrero (31-1-1, 18 KO’s) by a 12 round unanimous decision at the Citizens Business Bank Arena, Ontario, California, USA. Guerrero knocked Berto down once in the 1st and another time in the 2nd. Those knockdowns helped Guerrero pound out a unanimous decision by the scores of 116-110, 116-110 and 116-110. Berto, sporting a Mayweather-like left shoulder roll, chose to fight off the ropes the entire 12 rounds instead of the middle of the ring. This prevented Berto from taking advantage of his fast hand speed. However, it looked like he did this out of necessity for fear of running out of gas. With Berto pinned against the ropes, Guerrero was able to dominate the action simply by tapping him with slapping shots for the entire fight. Berto landed some really big punches that snapped Guerrero’s head in every round, but just like Selcuk Aydin, Guerrero’s last opponent, Berto wasn’t active enough to win the fight. Both of Berto’s eyes were nearly closed by the end of the fight. Guerrero also had his right eye close by the 11th. There was a lot of fouling going on by both fighters in particular Guerrero. He was credited with a 1st round knockdown after holding and hitting Berto repeatedly until he dropped. Guerrero threw a lot of rabbit punches in the fight. In a really sad episode, Guerrero teed off on Berto after the 12th round had ended, tagging twice with really hard shots while referee stood by. Keith Thurman (19-0, 18 KO’s) made a name for himself tonight in destroying junior middleweight contender Carlos Quintana (29-4, 23 KO’s) by an incredibly easy 4th round TKO to capture the vacant NABO junior middleweight title. Using heavy pressure and big power shots, Thurman hurt Quintana in the 4th round and then unloaded on him until referee Jack Reiss stopped the fight at 2:19 of the round. Thurman knocked Quintana down with a left body shot in the 1st. After that knockdown, Quintana was on his bike the remainder of the fight trying to keep away from Thurman. It didn’t work very well, because Thurman was able to cut off the ring expertly and land big single shots to the head and body of Quintana. The fight was like watching a cat chasing a mouse, as Quintana ran constantly and would hold Thurman each time he would get close. 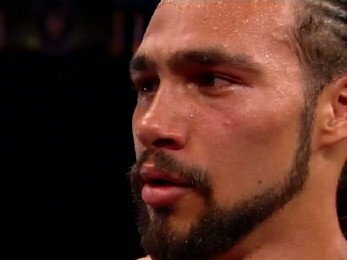 This win will definitely help get Thurman some fighters at junior middleweight, although I think it’ll work against him for getting important fights at welterweight. No ones going to want to fight him after watching this. He’s just too big fight the 147 lb division and is like a Julio Cesar Chavez Jr. of the welterweight division.